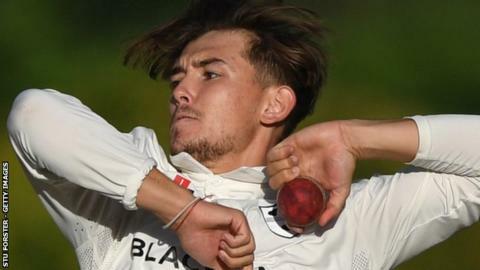 Worcestershire have revealed that young cricketer Ben Twohig will miss the entire 2019 season with a knee injury which he suffered playing football. The 21-year-old left-arm spinner picked up an anterior cruciate ligament tear playing five-a-side at Sixways, home of rugby union side Worcester Warriors. Twohig is to undergo surgery next Tuesday (16 April). "Ben Twohig had an MRI scan last week," said Worcestershire head of sports science and medicine Ben Davies. "This confirmed a diagnosis of an anterior cruciate ligament tear. He is due to have an arthroscopic procedure, and will then rehab for the next six to nine months. "Ben will undergo the rehab programme with a view to hopefully taking part in pre-season next year for the 2020 season. After missing last week's opening round of fixtures, Worcestershire, relegated from Division One last September, start their County Championship season on Thursday with a Division Two game against Leicestershire at Grace Road. They are also expected to still be without injured captain Joe Leach, who has been out since last June with a stress fracture of his back, which caused him to miss the final three months of the 2018 season. But New Zealand opener Hamish Rutherford, their overseas player for the first month of the 2019 campaign, is due to make his debut, having been booked for the Leicestershire match and five One-Day Cup games, ahead of the arrival of Australia batsman Callum Ferguson. Ben Cox, the county's new vice-captain, will skipper the side for the first time, in what will be also new head coach Alex Gidman's first game in charge following the winter backroom reshuffle at New Road.